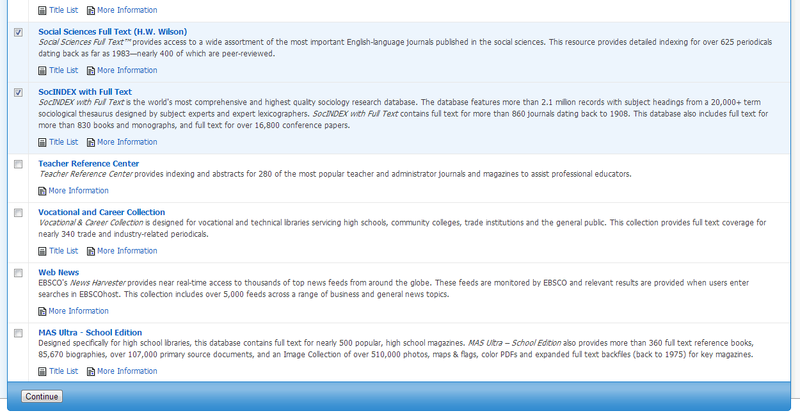 Dozens of the library's databases are on the EBSCOhost platform, and all of them use the same interface. Scroll down the alphabetical list and click on EBSCOhost. That will take you to a page that lists and describes all the EBSCO databases. Check off as many databases as you want and click the Continue button down at the bottom. You can also use the Article Databases list to search a single EBSCO database at a time by clicking on its name, such as Academic Search Complete, Business Source Complete, etc. 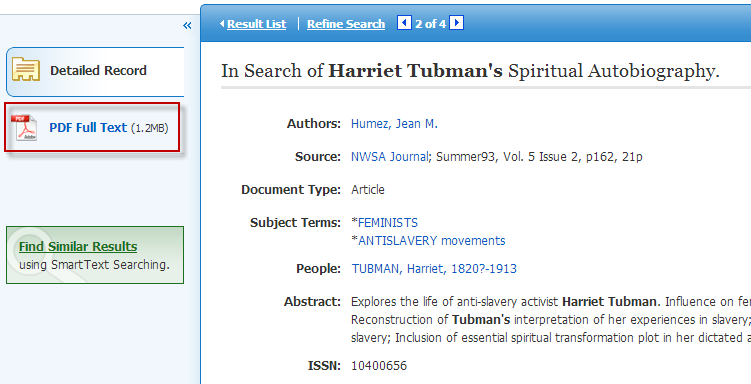 When you first log into an EBSCO database you will see the Basic Search box. Type your search into the box and click the Search button. To get to the advanced search screen, click the Advanced Search link right under the Basic Search box. 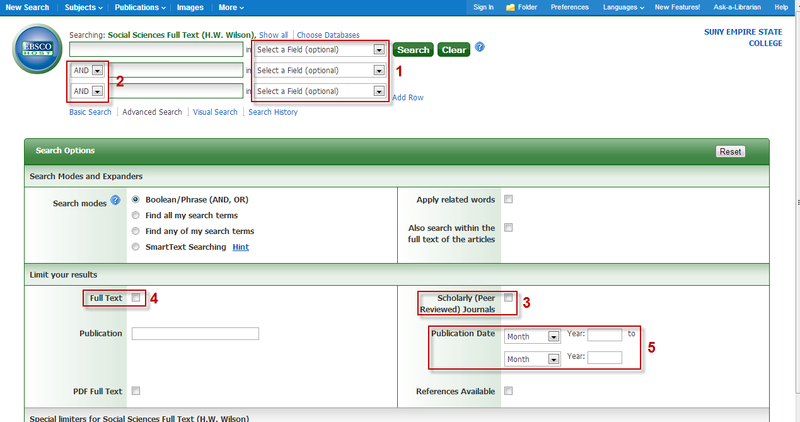 Each of the three search boxes has a Select a Field pull-down menu to the right of it. SU (subject terms) - controlled vocabulary. For more information about that, see Controlled Vocabulary. You can still use AND, OR, NOT, quotation marks and parentheses inside the search boxes the same way you would in Basic Search. You can limit your search to articles that are Scholarly (Peer Reviewed). These options are also available as filters on your search results page! Your search results page will display 50 search results per page, by default. If there is more than one page of search results, you will see page numbers at the top and bottom so you can look at all of them. Search results are displayed in reverse chronological order - the newest ones are listed first. To the left of each search result you'll see an icon telling you what kind of document it is - article from an academic journal, article from a magazine, conference proceedings, case study, etc. Beneath each search result is information on how to get the full-text of the article (the whole thing that you can read). More on that later. Filter by a publication date range. Filter by full-text (gets rid of search results that aren't in full-text in this database). Think twice before using this option because it's very easy to find out if the full-text is available in another database. More on that later! The title of the article is a link to the Article Information page. Authors, journal name, volume, issue, page numbers, publication date, etc. Abstract, which is a summary of the article's content. Read this before you spend too much time trying to locate or read the full-text! Print/Save/Export so you will have a copy of the article without having to search for it in the database again. A permalink, which you need to use if you want to save the link to come back to the article, or share the article with someone else. For more information about that, see How To Create a Permalink to an Article in a Library Database. 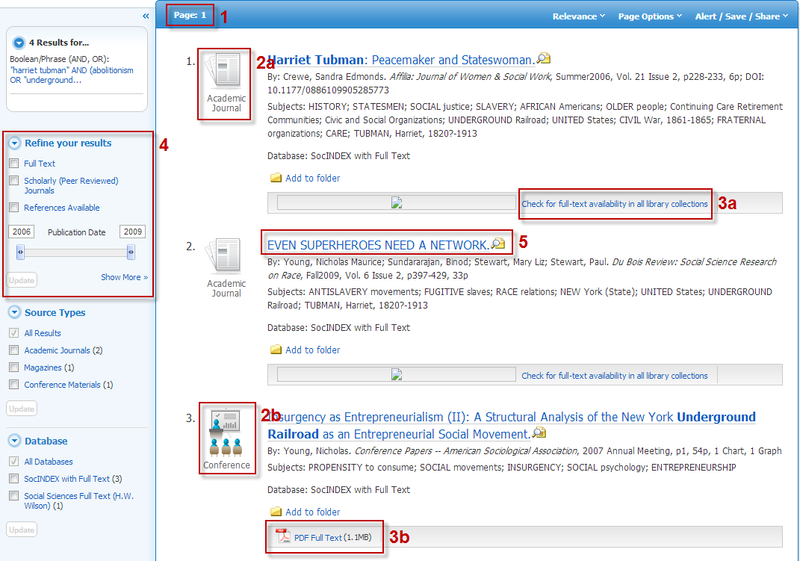 How to cite the article in multiple citation styles. Link to full-text, or Article Linker if full-text is not available in this database. More on that later! On the search results page, you will see the full-text link right below each search result. On the article information page, you will see the full-text link at the top left corner of the page. When the article is available in the database, you will see a little icon for it. PDF full-text has the exact same appearance as the print version. HTML full-text has the same words and images, but the layout is like a web-page. "Check for full-text availability in all library collections"
Most databases index, or list, more content than they actually have in full-text. While this can be frustrating, it's useful because at least it lets you know those documents exist out there somewhere. Often, they exist right in our library, just in a different database. That's where Article Linker comes in. Article Linker is a behind-the-scenes tool that will link you to the full-text wherever it occurs. If we have the article in another library database, you'll be taken right to it. If we don't have the article, you'll be taken to a page that says we don't have it.